A Marin County holiday tradition since 1966! Holiday boat parades on the San Rafael Canal have been helping Marin families celebrate for more than 50 years. Each year, thousands of spectators line the route to admire and shout holiday greetings to dozens of beautifully decorated, brightly lit boats as they pass. 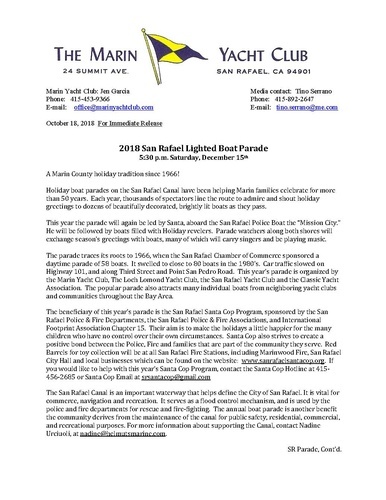 The parade begins as boats converge at the east end of the San Rafael Canal, across from Pickleweed Park at 5:30 p.m. The San Rafael police boat “Mission City” will emerge from the Marin Yacht Club marina to lead the parade. Boats will proceed east along the Canal to the Turning Basin behind Montecito Shopping Center, and back to Pickleweed Park.